Though the registered and trademarked device is called a 3D printer, perhaps it should be referred to as a replicator, as that is what it does – it replicates the size, shape and contours of a design part in actual size, within the limits of the machine, of course. It’s not as though you can just take the new Transit Van and hit copy and have two of them – at least not yet. Nevertheless, just to learn how to use the process, Ford engineers used it to output a miniature Model T and a couple of tiny superheroes. Check back in fifty years or so on the concept of copying entire vehicles. “We’ve been shifting from the tangible world to the computer world, and the reality is that a hybrid model works best,” says K. Venkatesh Prasad, senior technical leader, Open Innovation, and a member of Ford’s Technology Advisory Board, Research and Innovation. “There is nothing like having a tangible prototype, but it has always been time consuming and expensive to create. 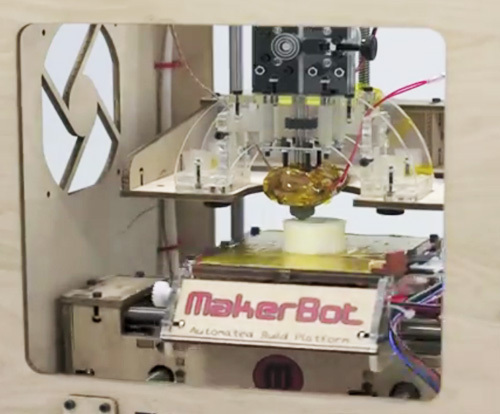 The MakerBot is a relatively simple device costing under $1,000 and with a growing online cadre of enthusiastic users. It is primarily the toy of independent entrepreneurs and hobbyists, allowing design and production prototypes to be created of various plastics or sand. Ford utilizes the quick and low-cost 3D output for small parts development – shift knobs, gauges and display modules, for example. It takes about three hours for the Thing-O-Matic to create one of the shift-knob sized pieces in the video above. It allows design variations to be output and directly compared on a tactile, ergonomic basis. Ford is using this new technology to bridge the gap between a concept and its actuality. Larger, industrial rapid-prototyping machines are speeding innovation in manufacturing and Ford has fully embraced commercial 3D printing. Three-D rapid manufacturing was used to develop components for the 3.5-liter EcoBoost engine, featured in the all-new Transit Van. Cast aluminum oil filtration adaptors, exhaust manifolds, differential carrier, brake rotors, oil pan, differential case casting and even rear axles were prototyped with the technology, encompassing selective laser sintering, stereo-lithography and 3D sand casting. Such 3D printing with sand allows the brand to cast patterns and cores with multiple printers on hand and Ford has taken a lead in the use of this process. The system allows the quick, real world comparison of design variations, speeds the selection of the design that will ultimately be produced in mass, thus improving efficiency and cutting the time to market, while boosting cost savings at the same time. In the C-MAX and Fusion Hybrid the process was used to refine rotor supports, transmission cases, damper housings and end covers for HF35 hybrid transmissions built at Van Dyke Transmission Plant. It was also used to enhance the EcoBoost four-cylinder engines for the Louisville built 2013 Escape. The system was used to redesign the brake rotors for the 2011 Brake rotors for the 2011 Explorer to address a brake noise issue found during durability testing. It was further used to model exhaust manifolds on the 3.5-liter EcoBoost for the F-150. Before too long, this process may enable the production of a useable replacement of a part on your refrigerator. By scanning the barcode or a model number, a rapid manufacturing machine may be able to output the needed part.